adventures in clay was one of those immediate favorite shops i marked on etsy. marianne's ceramic style is very unique and distinct: i love her use of shape like in her lotus and lace bowls. her etsy shop is full of so many lovely bowls, jars, and vases. 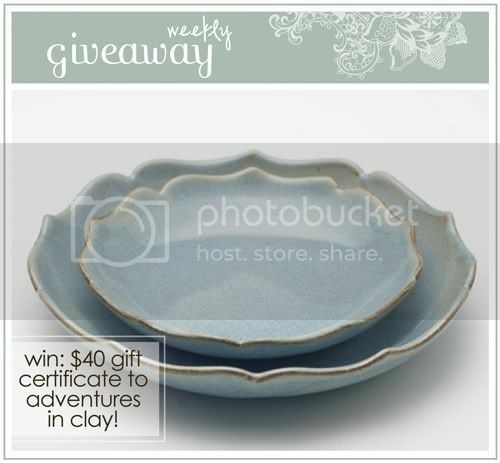 for this week's giveaway, adventures' in clay is offering a $40 gift certificate to use on anything in her store -- be sure to head over and check it out! Hello, please tell us a little about yourself + your beautiful shop: The short story is: I grew up in Germany, fell in love with an American exchange student in High School, met him again after college, got married, and moved to Northern California. And here we are: with two almost grown-up kids, a big old house with a large somewhat wild garden, and a studio out in back. It’s a lot of fun most of the time. I found out about etsy through a friend, and decided to give it a try. That was a year ago, and I haven’t looked back since. I feel a real connection with my customers, and am so happy that my pottery finds a home all over the world. How did you get started making your ceramics? I have always loved clay – soft and completely open to my ideas. Studying at a College of Arts and Crafts in Germany I followed a group of friends into Industrial Design, but got disenchanted, and felt the pull into the Ceramics Department in the basement where the big kilns were! I was happy to learn throwing, hand building, glaze chemistry and kiln firing – the craft and the art of ceramics. My dream was to someday work in my own studio. What inspires you day to day? It’s really when my inner world connects with the world around me that my creativity gets nurtured and sparked. Looking at some pointy flower petals in my garden brings Moroccan architecture and door openings to mind, which I then use to design a candlelight. I try to create graceful, elegant lines. My studio looks out onto an olive tree and some old metal sheds, a somewhat Mediterranean impression. Sitting at my wheel or carving a piece I can let my mind drift, and catch floating ideas – it’s very peaceful and fun. Next to the rusty sheds we planted artichokes. We don’t always remember to pick them, so they open up and bloom with their lovely purple heads. That sight led me to a bowl with artichoke-inspired leaves all over. (1) Get organized in your business – you want to save time day-to-day, and be prepared for increased traffic like during the holiday season. So set up your work area, organize your files, and have all your packaging supplies ready. It helps me to be more relaxed. (2) Great customer service – I try to answer convos promptly, package my pottery as if I’m sending it to a friend, and ship it quickly. Ask yourself what you appreciate as a customer. (3) Shop policies may not be exciting, but it’s really important to have them in place. They are like your boundaries ;) Research shops with similar items, and learn from them. I l.o.v.e. every single lotus bowl in the shop! Those delicate points are just to die for! I love love love the pale blue arches centerpiece! but it's not pottery...did i follow the right link? she makes such beautiful things! I'm not picky - tape or pottery for me! Hey Danni- the links you have under "How to Enter" are from a past giveaway. Just thought you should know. I love the snowy white lotus bowl set! I love the sky blue lotus dish! SO pretty! Love the japanese old book washi tape! What a wonderful find! Everything is gorgeous but I will pick the Midnight Blue Arches Centrepiece as a fave. Gorgeous! I follow on twitter (and everywhere else...that sounded a bit stalkerish! I don't follow you in real life)! I went back up to the link at the top - worked fine. I like her "snowy white" pieces, though all are drool worthy. the detail is stunning while the colors are soothing. I love love love the Snowy-White Lotus Bowl. This stuff is absolutely gorgeous! I am a follower on Blogger/Google. I love the Pretty Brown Floral Transparent Deco Tape! I blogged about your site! Follower of your blog! It rocks! Beautiful work! My favorite is the Swirly Blended Clay Covered Jar, perfect for storing accessories! Thanks for the giveaway. BTW the link to cute tape is from a past giveaway, thought you might want to fix that. All the lotus bowls are so pretty. I like the golden brown and soft green the best! Oh, wow. All of her pieces are so beautiful! I adore the Creamy Yellow Flower Vase. Love the snowy white ribbed cups. They are so lovely! I'm in love with everything from the snowy white collection! so beautiful. I love the deeper flower bowls, especially in that wonderful sky blue color. Coveting that color for my kitchen! love the bowl in yellow, the second down on the right. sooo pretty! I can't pick on thing. Really. I love that blue bowl at the bottom - so great! The lotus and flower bowls are amazing, but I really like the "Soft Green Flower Bowl Set". Oh gosh, her shop is amazing!! :) Please enter me!! gorgeous pieces!! thanks for sharing her shop! I like the Shiny Snowy-White Lace Bowl. I would use it as a planter. I have a lovely fern that would go great with it. i love all the blue dishes! From cute tape, I like the alphabet and number stamp set, and from adventures in clay, I love the smooth turquoise bud vase! wow absolutely gorgeous! I can't choose just one! and just about everything else as well!!! i love the snowy white lotus bowl! Love the green lotus bowl! beautiful! love the lotus bowls. Very interesting work. A bit old style but perfect for a mother's day gift! Oh wow - just stunning! My jaw dropped when I saw the turquoise matte lace bowl! All of her pieces are stunning! My favorite is the White Lotus Bowl set. I love each and every piece in her store. My favorite is Turquoise Lace Bowl. It's stunning! I follow! My favorite piece is the Sky Blue Flower Bowl. So pretty! They're all so beautiful! I especially love the Sky Blue Wave Bowl however. Wouldn't it look gorgeous with some bright oranges in the middle? Perfect for Summer! i want the turquoise matte lace bowl!! Can I say I'm in love with it all?! Okay okay it's like picking a favorite child: the Midnight Blue Flower Bowl set. I really like the soft green lotus bowl, flaws and all. I, quite literally, cannot decide what is my favorite in Marianne's shop, might have to be the midnight blue lotus bowl. The sku blue lotus dish is my favorite, I usually like for anything blue. Her creations are lovely. I love the snow white lotus bowls! I tweeted, followed your blog too! I had such a hard time deciding.. I like the shiny snow white lotus bowl.. also? Everything else. I'm so happy to have discovered your site. It is beautiful and so welcoming!!! I visited "Adventures in Clay" and am in love with the exquisite Swirly Blended Clay Bowl! What a lovely, graceful piece....it reminds me of ocean waves. I just can't get enough of the turquoise matte lace bowl! TO. DIE. FOR. I like the Sky Blue Flower bowl - we're redoing our living room and need color coordinated knick-knocks. I love the "Creamy Yellow Zig Zag Bowl!" I like the Modern Turquoise-Matte Votive Holder. I saw it on etsy's newsletter today, too. It would be a great decoration for my wedding! I love the SnowyWhite Lotus Bowl -- BEAUTIFUL! I am a blogger subscriber, too! I love the Creamy Yellow Zig Zag Bowl ! so cool! I LOVE her shop! Especially the turquoise matte lace bowl. Amazing etsy shop! These ceramics are gorgeous. I love the Four Snowy White Ribbed Cups! I also think that the bowls would make a great ring dish on my bedside table! I love the Turquoise Matte lace bowl. What an amazing piece and how great it would go in my kitchen! I love the midnight blue wave bowl. the color is beautiful. I am also a public follower. however, I think my favorite is the turquoise matte lace bowl - it looks so playful and spunky! I LOVE the yellow creamy flower vase - absolutely beautifu!! Thanks for the giveaway! I'm a follower on Google RSS. I love the Shiny Snowy-White Lotus Bowl. It just has such a delicate, feminine look to it plus I'm obsessed with bowls! Its very hard to choose, but I love the Turquoise Matte Lace Bowl! the creamy yellow lotus bowl is my favorite. her craftsmanship is AMAZING! So beautiful! My favorite item is the Smooth Turquoise Bud Vase. Love the bold color! Following you through Google Connect! SO Lovely this find! I love the swirly closed bowl! i love her turqoise votive holders! so pretty! I love the Snowy White Lotus Bowls! They are stunning! I love the Midnight Blue Flower Bowl Set! I love the turquoise bud vase and the Midnight Blue Flower Bowl Set! I love the pale blue lotus set- so pretty! oh man would I love to win this!!! i like all the lotus plates! The Snowy-White Lotus Bowl set is, without a doubt, my favorite. Love the organic feel of this shop. I must have the Two Sky Blue Indented Cups. So nice. I love the blue bud vase! beautiful!I love the blue bud vase.....beautiful!! Love the lotus bowls and the green paperweight! Also, I am a Twitter follower...not exactly sure how to be a Blogger follower but I want to be! Ohhh my gosh, such cute stuff! The pale lotus bowl set is definitely my favorite item, I love it so much! What a great giveaway! I love these bowls--just beautiful. There are some really nice things on this site. The photos are great and beautiful items. This is my fav! Btw, I just found your blog via sandy-a-la-mode. What a lovely blog you've got here! I added you to my blog roll. oh i love the lotus bowls! what a BEAUTIFUL shop!! i LOVE the Turquoise Matte Lace Bowl, such great detail! thanks for the chance to win! I love her work! 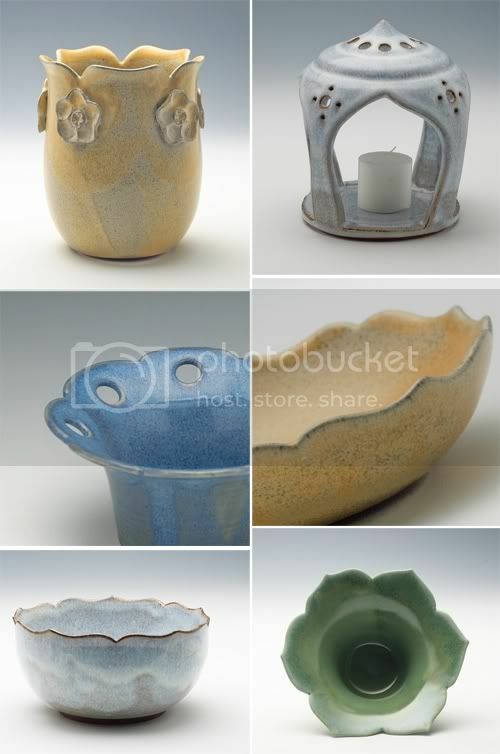 My favorite is the Pale Blue Lotus Bowl Set. My favorite is the blue wave bowl. Everything in the shop has such organic lines. I love it. Such beautiful shapes and colours. Would love to have a piece or pieces in my home! Hello, I love each blue bowl, but especially the lotus bowl. Have never seen your shop, great idea to increase traffic! Interesting pieces. My favorite is the Sky Blue Temple candlelight. I thought it was very romantic! I really love the Turquoise Matte Lace Bowl. It's beautiful! I'm following your blog on Google Friend Connect too. Thanks! Gorgeous works of art! While nearly everything pulled on my heartstrings, I really loved the elegance and simplicity of the Midnight Blue Flower Bowl Set! The carved edges are so perfect- I have a little crush on symmetry! the turquoise matte lace bowl is GORGEOUS. love the color and the detail! PS, I love Marianne's shop so much I posted this on my Fan page wall. Hope it sends handmade lovers your way! What a wonderful Give~Away!! I just love the scalloped dishes, they are so pretty!! ohhh love that! So beautiful! I tweeted about the give~away. CDAGifts. So beautiful! I love the turquoise stuff, particularly the lattice-ey ones! I follow ya on Twitter! Wow, I loved the Turquoise Matte Lace Bowl, it is amazing!!! Thanks for a great giveaway!! and for the link to an amazing shop! The sky blue wave bowl is so beautiful! All of the shop's pieces are. love both the frosty white and blue sky footprints!!!! What a lovely idea (the giveaway). I like the midnight blue flower bowl set, but everything is lovely. the sky blue flower bowl is adorable! ooh, I think it has to be the midnight blue lotus bowl - so striking! The sky blue flower is my fav! Beautiful shop!!! I love the Pale Blue Lotus Bowl Set, very elegant. I love the midnight blue flower bowl set, so pretty. love the lotus bowls and the candle holders! I follow you on twitter and I am a facebook fan. I follow throught google reader too! Definitely love the Lotus Bowls best, but can't choose a color! I love the Turquoise Matte Lace Bowl. The Lotus Bowls. Probably yellow, but I can't really decide! I love all of the lotus bowls! They're just stunning and look both homey and elegant at the same time. Love these forms and glazes! I'm definitely eyeing the Shiny Snowy-White Lotus Bowl Set. I went to the shop and just loved all the lotus items. The colors are so beautiful!! The lotus bowls are so beautiful. The Swirly Blended Clay Covered Jar is my favorite in the shop. The colors are great, the form is amazing from the shape to the way the pieces fit together; everything about it is just absolutely gorgeous. So beautiful. My fav is the Shiny Snowy-White Lotus Bowl Set. Thanks. OMG... her Snowy White Flower Vase is spectacular!! dear god, I love the lotus bowls. all of them. every single one of them! oh, the shape and elegance and speckliness of them. I'm in awe of their splendor! i just really love the simplicity of the snowy white lotus set. thanks for the chance danni! These are so unique and I really like the colors! My favorite has to be the yellow bowl. I would use it for my fruits! !